I'll be travelling with D later this afternoon to visit his mother in Essex, but before I start packing up and getting ready to go, I thought I would share a recipe with you that you could perhaps make for your New Years Eve party - Roasted Squash, Red Pepper and Parsley Loaf, or Terrine if you so wish. After another visit to Usk Farmers Market a week or so back, not only did I come back home with some proper home-made bread that I have been thoroughly enjoying, I also bagged at a super bargain price a mixed variety of squashes: uchiki kuri, acorn squash and patty pan and a handful of fresh parsley. I decided to remake the Pasta Loaf I made earlier this month with Swiss chard, this time with the squashes. I would like wish all my readers: new and old a very Happy Christmas. 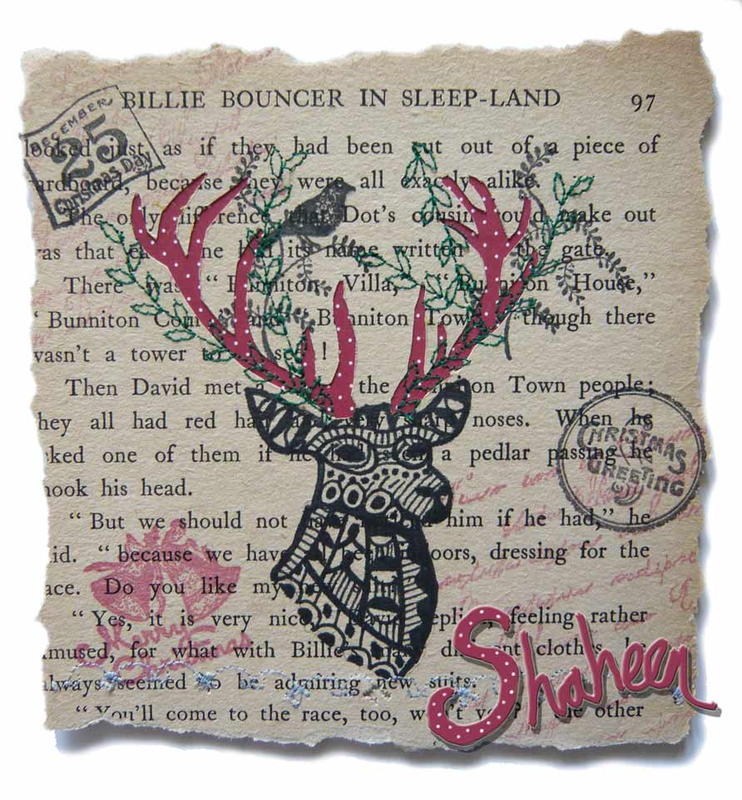 I share with you a beautiful festive mixed media collage card made for me by my very talented friend Patty aka Sally over at Poppycock & Other Creations. Enjoy your Christmas day, night and evening. Happy Christmas. 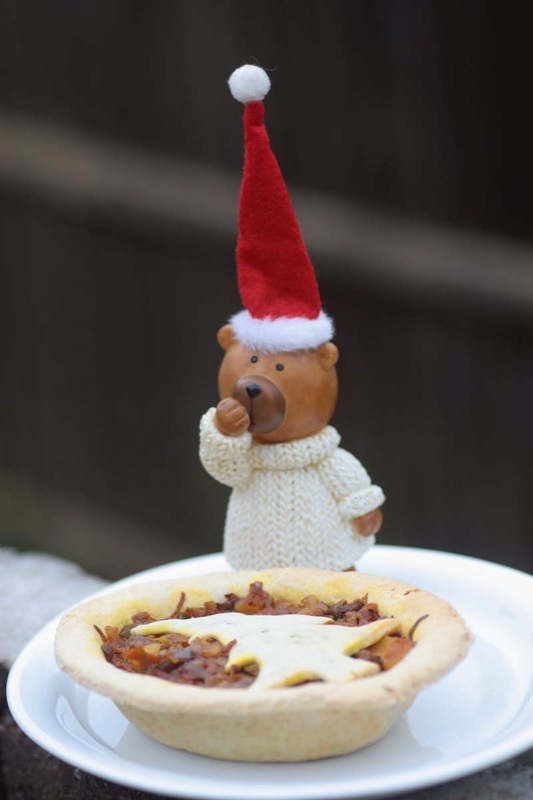 Another vegan Christmas recipe to share. I don't want to be bah humbug, but for those of you who know me now through blogging will know why I am feeling this way, And it to those of you who have taken the time to leave a warm comment; and for those of you who have e mailed me too that I would like to Thank with all my heart. Your words have given me much comfort. Thank you so much. I remain heart-broken and it will be fair to say that any good spirit that I had for Christmas has now been overshadowed by this unhappiness and my heart and mind is just not into joyful blogging. However, I do have a backlog of Christmas recipes and now is the time to show them, so the posts in the next few days may remain simple and to the point. 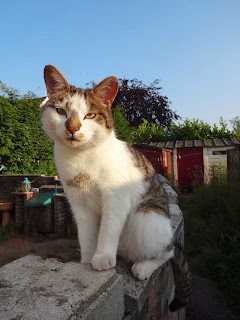 Those of you who read my blog regular will remember me introducing you to my new garden friend who I fondly named Moggy. Long story, but upon taking Moggy to the vet a few months back for having a poorly paw, we found out who the owners were. 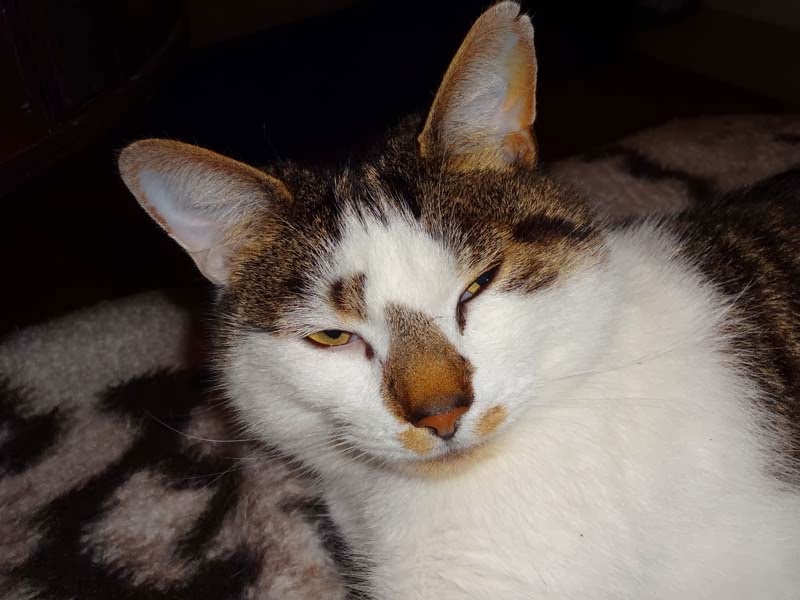 The cat's original owners were on the move and staying in temporary abode whilst they found a new home, so the cat was left with the sister who lived not that far from us. Except this inquisitive cat wasn't happy there as there was another cat there, so it found its way to our home and our hearts. We made an agreement with the original owners that we would foster the cat that we named Moggy until they found a permanent home. 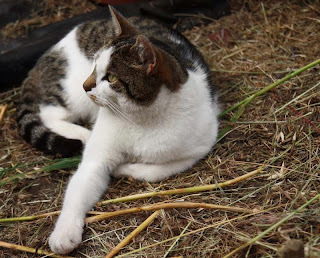 Yesterday afternoon, Moggy did not turn up for lunch. It's not that unusual, sometimes it goes exploring, but then it got to 5 o'clock and still not appeared. I started to get worried. Then I got a phone call. It was from the owner. It was not good. She had got a phone call from the RSPCA that Moggy had been run over. Worse was yet to come, he had lost the use of both of its back legs. It was so bad that he had to be put to sleep forever. 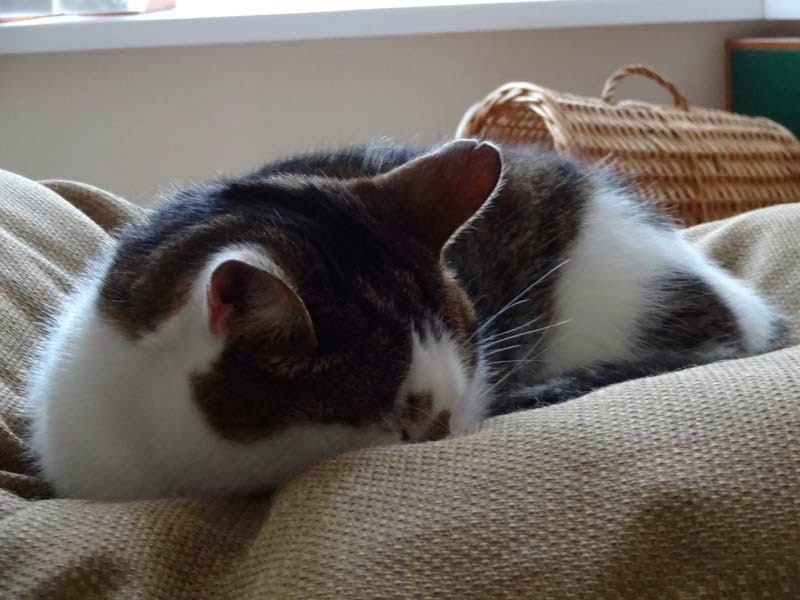 I know it may sound silly to some, that a small animal can have such a big emotional impact on a human being, but I am absolutely heart-broken and have been crying since I was told of the sad news. It is in his honour that I write this short blog post, a way for me to grieve as well as record our time, albeit a short one together. I knew he would be leaving us oneday, but to be taken away from us in this very cruel way, really, hurts. I really cannot believe he's gone this way. 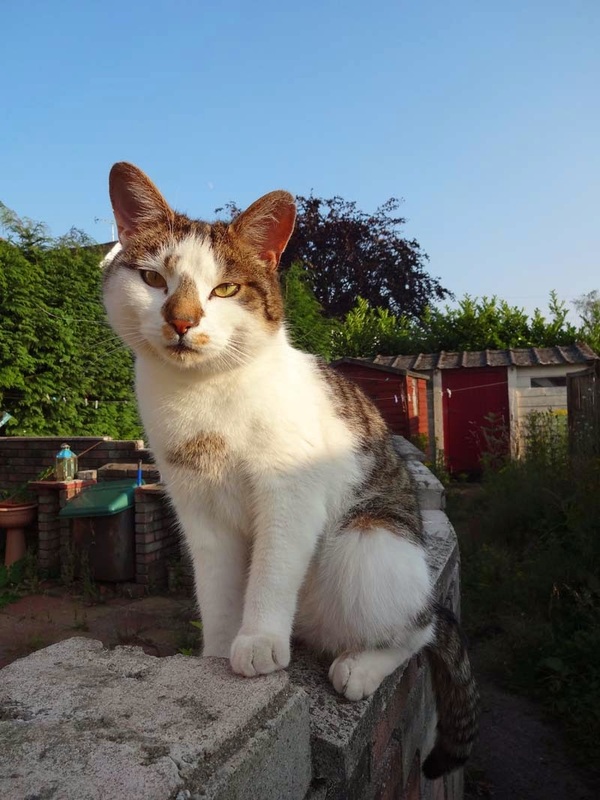 I keep looking for my fur ball of a friend: sometimes out of the kitchen door window, hoping to see him sat on its cushion waiting for his opportunity to come in. I keep looking up at the bedroom window where it sat looking out at the passing traffic; and even the bed next to me where it often napped on its tiger blanket whilst I sat on the computer. This is my way of saying that I just cannot stop thinking about him. 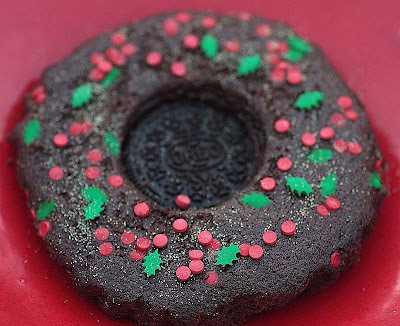 After having a go at making the Oreo Wreaths and Gingerbread Men Shaped Cakes for the Christmas table, I thought I'd attempt mini Ginger and Chocolate Cakes. 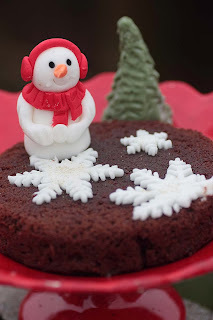 The real excuse for making these was to try out my snowflake fondant cake decorating plunger cutters as these cakes would have been quite plain to look at otherwise. I have to say, the transformation was quite dramatic, even so with a sprinkling of edible gold glitter and a light dusting of icing sugar. If you like ginger, then you will like these Gingerbread Men Cakes. Some of you may remember early in the year I made some vegan gingerbread cake. 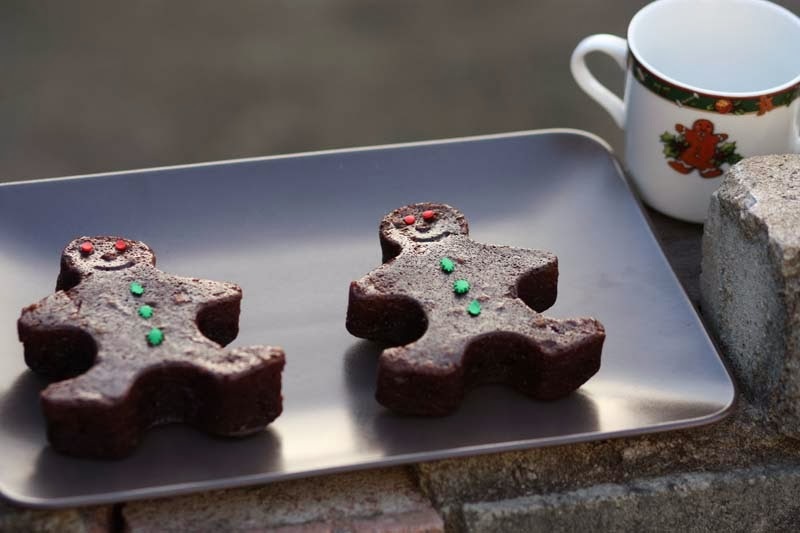 They did look quite plain, so I promised you that I would use my gingerbread cake men moulds, well here they are. These are the same moulds I used for my Halloween Beetroot Pies. Unlike it's biscuit brother, these are softer to eat, and the ginger comes through quite strong. This idea came to me only last week when I was planning to attend an event at a nearby village; and in anticipation of the arrival of lots of kids I thought abut making something that they would be a bit more familiar with, that my usual vegetable based sweet creations which may have got the snug nose reaction. I often make what I call an 'Oreo Surprise cake', something that my lovely friend Choclette from Chocolate Log Blog tried when she travelled to Wales this summer for a family wedding. I thought I would go one step further and douse the cocoa batter with edible decor in the form of holly and berries. 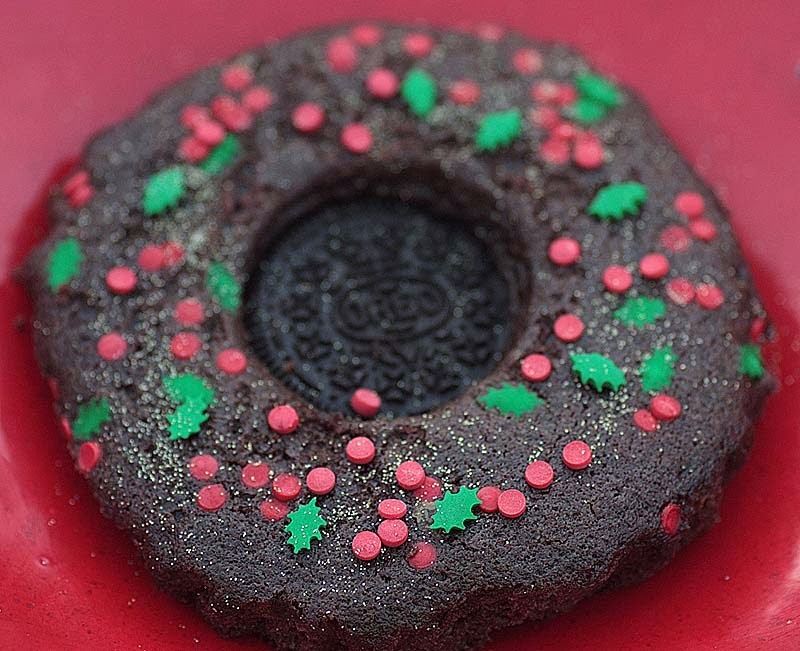 And as i f by magic, the edible mini Oreo Christmas Wreath cakes came into existence. I don't know so much about the big kids, but the small kids liked it. D very rarely buys me flowers or surprises me with a box of chocolates. I am not saying he's not romantic. He just shows his affection for me in different ways, such as coming home with a bit of kitchenalia such as that manual flour sifter a few years back; or more recently coming home with a bottle of pomegranate syrup. The pomegranate syrup is designed for flavouring coffee or dousing over ice-cream, but I had other ideas for it. I decided to add it to cake. 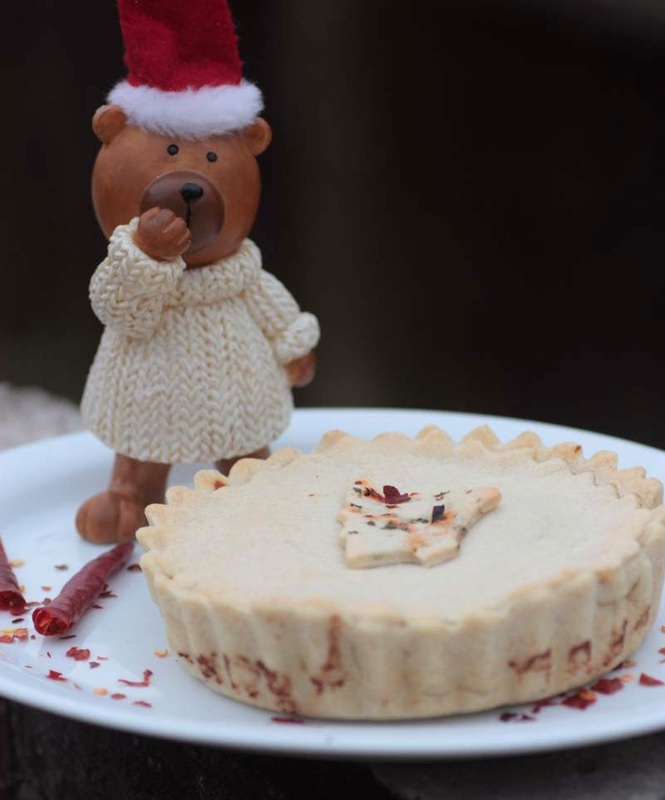 Pomegranate is a very Christmassy festive seasonal ingredient. 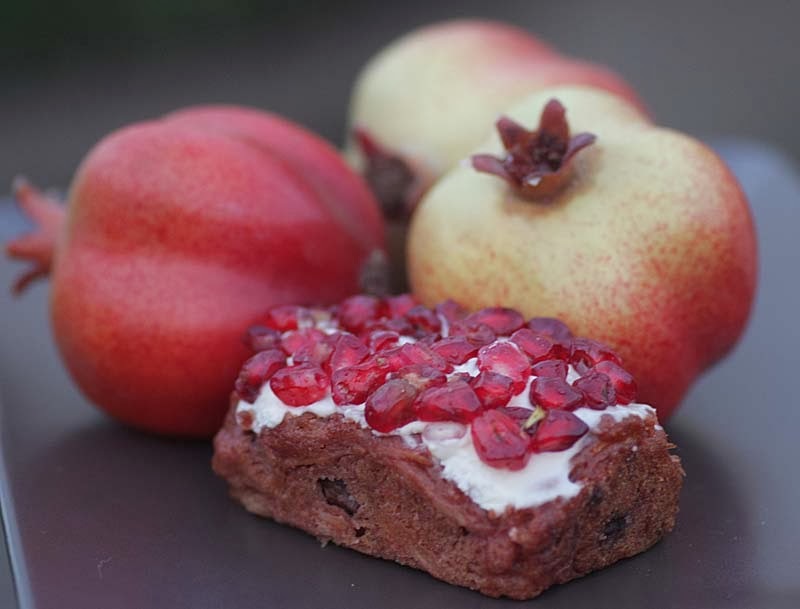 As well as flavouring the vegetable cake with pomegranate syrup, I also decided to pick up some fresh pomegranates and painstakingly tweak out the little red seeds, so that I could top of the Pomegranate Parsnip cake with these edible shimmering precious stones and make it look visually stunning. Not only do you get the flavour from the syrup, you get a fresh squirt of pomegranate juice when you bite into the cake too. Yum. I've had a tremendously busy day today, and a rewarding one too, it's lifted my spirit. So I am off to put my feet up and enjoy what is left of my evening, but before I sign off from the blog, I thought I would share with you a recipe I made a week or so back when I visited Usk Farmers Market, where I discovered the most wonderful home-made bread and was seduced by these tall long ruby chard stems. I really miss growing rainbow chard at home, so was delighted by this find. I picked up a bag full that looked like a bunch of flowers and would look wonderful adorning any vase. But the ruby chard was not for admiring. I knew exactly what I wanted to make. My husband reminded me of this pasta dish I used to make. 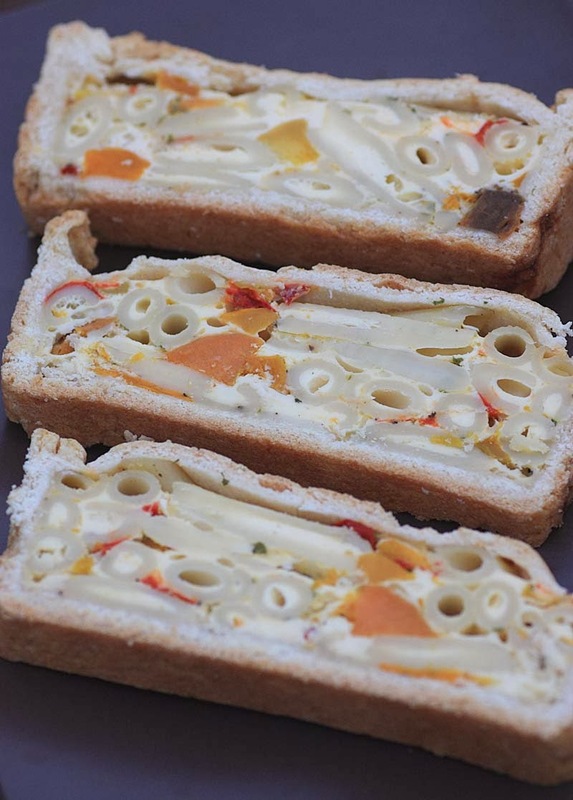 although its nothing like a macaroni cheese pie, its the closest thing I can think of to describe this pasta dish that is baked in a pastry. 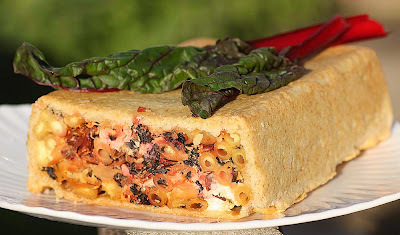 I usually make this pasta loaf with spinach, but with the red chard to hand that is what I used.